Today the government scrapped 'no fault' evictions. They didn't do it out of the kindness of their hearts, but because of the pressure of a growing tenant movement. Today’s announcement that the government will scrap notorious ‘no fault’ Section 21 evictions is a resounding victory for those of us engaged in the fight for decent, dignified and secure housing. For thirty years this pernicious piece of legislation has enabled landlords in the UK to evict tenants for no reason with a paltry eight weeks’ notice. So, why have the Tories made this announcement and what do they hope to gain from it? 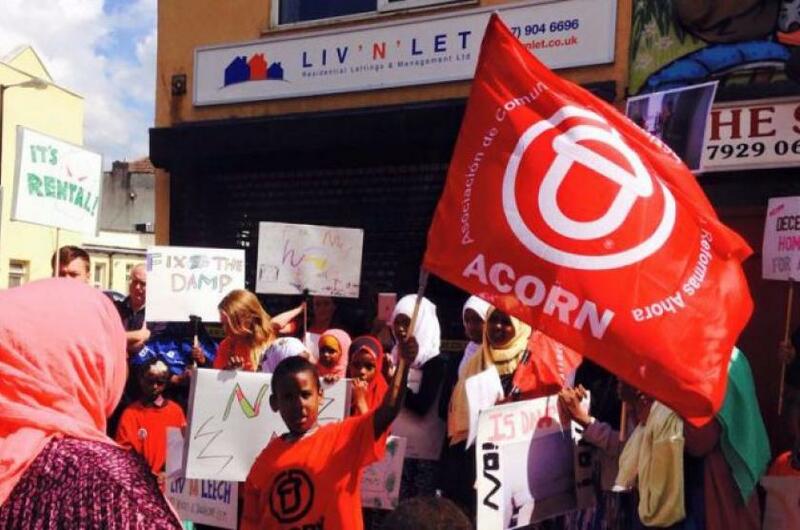 ACORN tenants union celebrates its fifth birthday next month. When we began there were no initiatives aimed at the organisation of tenants at the grassroots level. Today, the picture looks very different. Since we launched our first neighbourhood chapter in inner-city Bristol we’ve built a union of thousands the only way it can be done: door-by-door and street-by-street. We’ve taken the fight directly to the doorsteps of violent and bullying landlords, chiselling letting agents, wealthy property developers and uncaring politicians. We’ve fought the effects of Section 21 communities across the country. Our members deliberately put their bodies in the way of landlords and bailiffs, using direct action to prevent them from kicking people out on the streets. It’s no secret that the UK is in the depths of a housing crisis. Three decades of social housing sell-offs, stagnant wages and astronomical house prices have forced millions of working-class people into the private rented sector where we have been at the mercy of predatory landlords, flush with buy-to-let mortgage money. Our commitment to direct action does not preclude a fight at the ballot box. Come election time, 4.5 million privately-rented households could command a huge voting bloc. Recognising this, we registered thousands of insecurely-housed tenants at the last general election. As the opposition, Labour have been responsive to our demands. If the Tories want to appeal to renters, they have no choice but to start making some significant commitments too, or risk being swept aside by the growing political power of the tenant vote. This is not the first time the Tories have felt compelled to legislate for more secure tenancies. In 2015, the Deregulation Act claimed to have banned retaliatory or revenge evictions, but it turned out to be a monumental failure. The complexity and inadequacy of the legislation – which purported to prevent landlords from serving a Section 21 notice within six months of a local authority order for repairs – meant that only 5% of all revenge evictions were prevented. As the worst housing crisis in living memory bites deeper, and the miserable reality of the rental market adds fuel to the fire of tenant anger, a floundering Conservative government has been forced to take action. And it was very much forced – today’s announcement will be anathema to those within the party who supported and benefited from the Thatcherite deregulation and privatisation of the rented sector in the 1980s. Unpopular governments often try to spend their way to popularity. But with the government tearing itself apart over Brexit and ideologically committed to austerity, the Tories have very few cards to play. Faced with this reality the Tories have had to find another way to appear like they have skin in the game. Luckily for them, scrapping Section 21 evictions doesn’t cost them any money – unlike the massive programme of council house building that is a fundamental prerequisite to solving the crisis. Public housing construction is down 90% since the Tories came to power. Their opponents in Labour have promised the largest council housing construction programme in 30 years (albeit under the vaguer rubric of ‘affordable’ housing) – it’s easy to see why the government feels under pressure. Although the private rented sector is a money-spinner, it’s awash with small-time landlords. These aren’t as well-organised as the Tories’ big business allies, and therefore command less political power. While this will undoubtedly anger many landlords, there’s no obvious place to transfer their votes. The Tories are gambling that today’s reform will not be enough to alienate the landlord vote altogether, and might even bring some tenants back onside. The obvious and necessary next step – rent controls – would create a much clearer wedge between tenants and landlords, and go much further towards solving the crisis. This is something that they want to avoid. Britain’s private rented sector was originally intended to temporarily house students and young, single workers. But, with the ideologically-motivated destruction of council housing, it is now the only long-term option for millions of families, many of whom have seen their standards of living decline after a decade of stagnant wages and austerity. This places the party of ‘family values,’ as the Tories like to portray themselves, in a difficult spot. The manufactured housing crisis has become so severe that it is now impossible to ignore. Seeing hundreds of thousands of children in temporary accommodation after being evicted doesn’t sit well with anyone – including traditional Conservative supporters. Secure tenancies are a solid platform for happy families, and that is an argument the Tories don’t want to give their opponents. But after such a dismal record it may already be too late. Today’s announcement represents the most significant advance for tenant rights in thirty years, but it was not handed down to us from on high. Instead, it was won by the power of organised tenants whose anger, dedication and discipline have dragged an uncaring Conservative government to this concession. Without the pressure exerted by unionised tenants, it is likely Section 21 would never have been scrapped. Renters have forced the Tories into a corner. But what they may not realise is that this greater security will help tenants open up a new front in this fight: the battle for rent controls, which can help to ensure that housing becomes a social and human right and not an asset to generate profits for a few. ACORN fights for its members and the communities they come from. Nurses, shop workers, drivers, carers and parents: we power society, and we demand our fair share. We know what we’re entitled to. And now we have a union that can win it. Nick Ballard is the national organiser of ACORN tenants union. Jonny Butcher is the Sheffield organiser of ACORN tenants union.